Microsoft Kinect creative director Kudo Tsunoda was showing off an intriguing new 'pet sim' game called Kinectimals at this year's Microsoft E3 press conference in LA. The demo showed a small girl looking after a pet tiger on the screen, managing to be both slightly adorable and also a bit scary at the same time. You can see a few of the new screengrabs from Kinectimals right here. And you can also read our in-depth run down of all the news from Microsoft's E3 Kinect reveal and the company's E3 press conference. Tsunoda said that with Kinect "you interact with Xbox 360 just as you do in the real world using your body and your voice," adding that Kinect is a "truly social" experience. 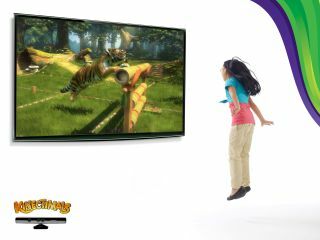 Kinectimals lets you play games with and stroke your virtual pet tiger. It was a very impressive-looking demo from the Kinect man, with Microsoft clearly looking to capitalize on the recent trend for virtual petting started by Nintendo with Nintendogs on DS.